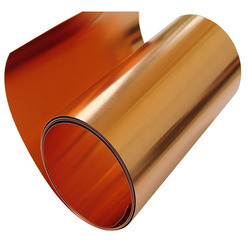 We are a leading Manufacturer of electrodeposited copper foil, rolled copper foil, shiny copper foil and copper foil from Pune, India. Leveraging on wide expertise, we are instrumental in offering high quality Electrodeposited Copper Foil. We bring forth the unrivalled range of electrodeposited copper foil that finds its application in PCB industry. Especially manufactured for multilayer production the offered foil is available in C1100 and C1220 grades. We are partnered with renowned sources and make sure to procure the premium quality raw material for developing the robust range of copper foil that complies with the set industry standards for chemical composition, thickness, temper and electric conductivity. Owing to our technical prowess, we have surpassed the competition by offering best in class Rolled Copper Foil. We take pride in presenting the flame retardant copper foil that is ideal for electric springs and switches, lead frames and cable armoring and highly utilizing in the PCB field. The offered foil is developed in wide range of thickness specifications and can be ordered from us in C1100 and C1220 grades. 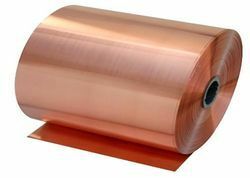 Further, we are providing the quality tested grades of copper foil at the best price in the marketplace. We have full devout in offering the best quality Shiny Copper Foil. Owing to our modernized R & D setup we are able to present a broad gamut of copper foil ranging from 0.005mm-1.2mm thickness. The offered foil is used widely in the PCB industry and also finds its application in ion battery production and lamination with PI film. We are procuring quality tested raw materials to present the industry compliant quality of copper foil which is accessible in C1100 and C1220 grades from us at the best price in the marketplace. Owing to our expertise and dedicated workforce, we have been able to offer optimum quality Copper Foil. This foil is manufactured under the supervision of expert professionals, using best quality products. Appreciated for their unmatched quality and fine finish, offered copper foils are highly demanded among the clients.